You can tell a Softail® motorcycle by its horseshoe oil ank, hidden suspension, and uncommonly smooth ride. If it doesn't have any one of these three things, it ain't a Softail®. Your 2011 Softail® models benefit not only from the kind of cool custom styling that make motorcycles go from metal machines to moving works of art, but also from the engineering marvels that make that ride unmistakable. 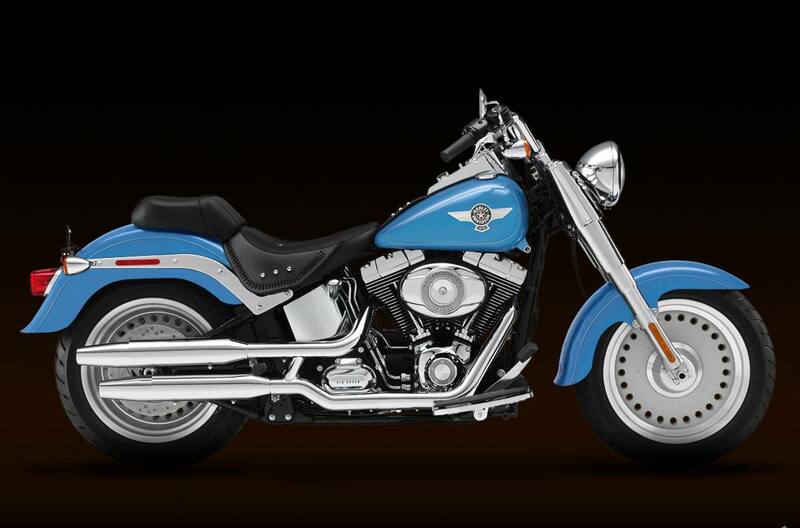 The 2011 Harley-Davidson Softail Fat Boy FLSTF is one of the quintessential cruiser motorcycles. Hearkening to the "hardtail" choppers of the '60s and '70s, the Harley-Davidson Fat Boy motorcycle keeps that heritage alive more than forty years later. The FLSTF Fat Boy is the original "fat custom" bike—laid-back and luxurious with an unmistakable profile on the road. Take a seat on this Harley and get the experience of one of the 2011 Harley cruiser motorcycles. Fat custom styling: Hearkening to the "hardtail" choppers of the '60s and '70s, the Fat Boy® motorcycle keeps that heritage alive more than forty years later. This is the original "fat custom" bike--laid-back and luxurious with an unmistakable profile on the road. But the nostalgic style isn't just about the confident stance, chrome and old-school detail. It's how you look riding it. It's how it feels. It's the classic, relaxed riding position. You're not just cruising. You're in charge--kicked back on a throne of machined metal surveying your domain. Fat features: Big in all the right places. The 17-inch wheels of silver, bullet-hole, disc-cast aluminum definitely make an impression--especially with rubber 140mm wide in front and a beefy 200mm in back. And check out the chopsticks up front--fat front fork behind the huge, gorgeous headlamp. The handlebars are wide, giant stainless steel with bare-knuckle chrome risers. Plus, a new fuel tank medallion in 2011 boasts a generous slab of mirror chrome finish--noticeable on any stretch of road. It's a lot of fat in one tight bike. Definitely meaty. Wide. Big-boned. A bruiser. Call it what you want. Just admit that you want it. Hidden rear shocks: If you want a comfortable bike but love that rigid-suspension look, you've come to the right bike. We've kept all the modern comforts where they belong--below the surface of a rad, vintage-looking bike. You get the classic lines of a vintage "hardtail" frame with the horizontal rear shocks hidden in the guts. It's a signature rigid look, and you'll only find it on a Softail® model. Tank-mounted console: For 2011, the speedometer face boasts an even bigger, bolder display for the odometer and offers up more information on the fly, like an ancillary display for gear and rpm. Premium paint: Up to two times thicker than the competition, custom quality paint comes standard on all Harley-Davidson® motorcycles. Clearcoat layering up to five mils deep. Bigger metal flakes. Unique effects in the pearl colors. Skimping simply is not in our vocabulary. Hand finished fuel tank: All Harley-Davidson® fuel tanks are finished by hand--that's what makes them stand out from the competition. Their seamless design and unmatched style are unique among all motorcycles on the road. The tanks are one of the first and last things people notice when they lay their eyes on a Harley-Davidson® motorcycle--so we make it worth their time. Twin Cam 96B™ engine heritage: The knowledge of what makes an engine truly move a rider runs deep at The Motor Company, and it was put to good use when we created the Twin Cam 96B™ counter-balanced engine. We sweated bullets perfecting every cubic inch, pushing design and technology forward. And we did it all without compromising one bit of Harley-Davidson's unique styling. Evolved, yet carrying on the legacy of the Flathead, Knucklehead, Panhead, Shovelhead, Evolution® and Twin Cam 88® engines that came before. The performance and durability are a direct result of the untold miles logged on the V-Twin since 1909, and the proud heritage that comes from a century's worth of commitment to life on two wheels. Twin Cam 96B™ engine innovation: Fire up the air-cooled, rigid-mounted Twin Cam 96B™ counter-balanced engine and feel the low-end torque unleashed for a smooth ride. Thanks to the lightweight piston design, delivery of the added power is more refined than ever. Then put your foot on the shifter and feel how the engine and Six-Speed Cruise Drive® transmission were designed to work together. Six speeds. A strong driveline and strong internal parts. Low routine maintenance. And a low cruising rpm couldn't feel better. Pure Harley-Davidson styling: Feast your eyes on the Twin Cam 96B™ counter-balanced engine and there's no mistaking its roots. This is authentic Harley-Davidson® style through and through with an attention to detail you won't find on any other bike. The black powder-coated engine features machined cooling fin tips and is topped off with brilliant chrome rocker covers. Rigid-mounted and air-cooled, the 1584cc Twin Cam 96B™ engine provides increased power, smooth performance and a maintenance-free built-in primary auto chain tensioner. It's a jewel machined out of metal. Pure. Dripping with power. From the classic edge of the cooling fins to the clean lines of cases and covers--the Twin Cam 96B™ engine makes an ironclad statement to holding on to what's right and staying true to what satisfies the rider. Six-Speed Cruise Drive®: You want a ride that rumbles--not begs for mercy--when you lean on it a little. The Six-Speed Cruise Drive® transmission provides smooth, quiet shifting and reduces engine speed on the highway, so you get a better match between engine turnover and road speed. It's a rare ride when a bike responds like this, and a low growl goes a long way when you're opening up the road ahead. Classic Harley-Davidson® rumble: Iconic, fierce, the most distinct decibels you'll ever hear bouncing off city canyons or scenic country landscapes. The sound of a Harley-Davidson® motorcycle has a rich history of its own. It's a classic roar. It's the sound of freedom, soul and self-expression. Anti-lock brakes (optional): When it comes to the Fat Boy® model with optional ABS, "stopping power" has a double meaning. The components of our ABS are tastefully hidden within the wheel hub, so you'll still turn heads with clean, streamlined designed. More importantly, though you get certainty in the saddle knowing your bike's going to behave when you need it. Offered as a part of the "Security Package" (which includes the H-D® Smart Security System). Artfully hidden technology: Harley-Davidson® leverages the latest in technology without compromising style and function. That means we hide electronics. The whole wiring harness is skillfully routed behind the jewels of the bike--the tank, engine and all the other eye-popping features you want to see. It's just another way The Motor Company goes the extra mile to give its bikes that premium, top-of-the-line fit and finish. Fat Dunlop® tires: Whether you're crossing state lines or staying within city limits, you want a confident feeling of sure contact with the road. The front end holds a premium touring tire with a three-ply polyester casing and two fiberglass belts. The back cruiser tire has an advanced tread pattern. Made from a specifically formulated compound, it delivers outstanding grip in wet or dry weather. And since they're from Dunlop®, you know you're wrapping your premium rollers in quality rubber. Tuned to be ridden: Harley-Davidson® motorcycles are different from any other bike out on the road. There's a balance to them. The steering, the maneuverability--it's all in concert. And each Harley-Davidson® model is tuned differently to create a unique riding experience for each individual no matter which bike they swing their leg over. Let's face it, we didn't get to where we are by being like everyone else. Convertible two-up seat: Hit the boulevard in style with the classic Softail® two-up seat. It's comfort for you or two. A bigger passenger seat and contour backrest to keep your passenger as comfortable as you. The classic, old-school styling includes a studded seat valiance that matches your bags, and the seat pillion is detachable. Just ditch it for stripped-back, solo profiling. Or leave it on and bring your better half along for the ride. Seat engineering and design: The seat is home for Harley-Davidson® motorcycle riders. They want a seat that has unique style without sacrificing comfort. Because of that, Harley-Davidson® invests a lot of time in researching, designing and testing seats so that every bike has just the right saddle. Engine idle temperature management strategy: Our motorcycles are built to be ridden. A lot. So that means that rider comfort is top of the mind. Always. With the Engine Idle Temperature Management Strategy (EITMS) feature, the motorcycle automatically cuts fuel and fire from rear cylinder when idling, which helps reduce engine heat felt by rider and passenger. This feature can easily be turned on by your dealer. Seat Height, Laden: 25.4 in.